AP Physics 2 started class sharing their mathematical models for pressure vs. depth below the surface of a fluid. In general, students struggled a surprising amount getting the equation for the best-fit line correct and handling unit conversions. One student shared that they needed a week to get back in the swing of things (it is the eighth day of class), and another shared that them struggling with this was “kind of sad.” Once we got the mathematical models captured in the Google Doc correctly, I was surprised at the range of values for the slope. We discussed potential sources of major systematic error such as losing the seal between the glass tube and the plastic tube or heating up the air trapped in the plastic tube by holding it tightly throughout the experiment. I need to investigate calibrating the pressure sensors and seeing if the experimental technique can be improved to gather higher quality data. 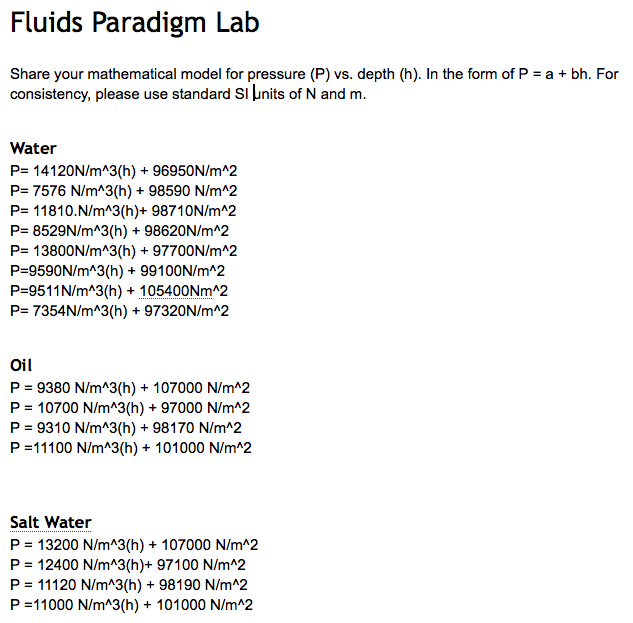 After discussion the lab, we derived the general form of the equation through application of the balanced force particle model on a cylinder of water at rest within a beaker of water. It was good to reinforce a basic model from last year.